The US announced Thursday that coalition forces had carried out 17 airstrikes against Islamic State targets in Tikrit ahead of an assault on the city by the Iraqi army and Shia militiamen from the Popular Mobilization units, now under way. The airstrikes targeted checkpoints, two bridges, two ISIS staging areas and a command and control facility. The order to send in the warplanes came after a request from Iraqi Prime Minister Haider al-Abadi, after a ground offensive to take the city stalled. The operation to retake Tikrit, about 160km to the north of Baghdad, began earlier this month comprising of about 20,000 soldiers from the Iraqi army and police as well as Shia militiamen from the Popular Mobilization units. The assault is being coordinated by Iranian military advisors, led by Gen Qasem Soleimani from the revolutionary Guards Quds force, renowned for their military discipline and prowess. 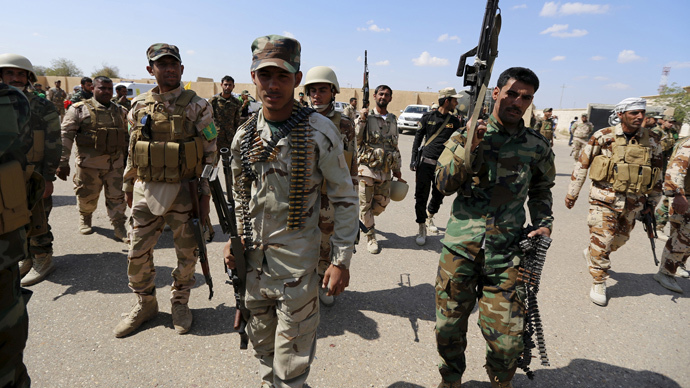 The government forces initially made rapid advances, despite not having air support and entered northern and southern areas of Tikrit, as well as capturing a number of nearby towns and villages from ISIS. But the over the past couple of weeks the offensive stalled with both the army and militia suffering heavy causalities as Islamic State militants dug in and planted a large number of bombs in roads and buildings around the center of the city. In this kind of urban warfare, precise firepower provided by coalition aircraft can help dislodge Islamic State militants. “These attacks are intended to destroy ISIL strongholds with precision, thereby saving innocent Iraqi lives while minimizing collateral damage to infrastructure,” said US Lt-Gen James Terry. The Pentagon has been at pains to say it is not cooperating directly with the Iranians but is working only with Iraqi armed forces, although privately it is understood the Iraqis alone are not up to taking on ISIS and need Iranian support. There has also been disagreement between the Iranian backed Badr Brigade militia and the Iraqi military over the need for US air support. The Popular Mobilization comprises of dozens of Shia militia and was formed in June 2014 after the Iraqi army collapsed in the face of ISIS’s rapid advance. Iran supplies funding and weapons to the militias and reportedly controls some of them directly.